Dubai, UAE, August 02, 2018: According to a recent UK survey of 92 dermatology clinics, adult acne sees a 200% rise due to poor diets, stress and pollution, which all contribute to triggering the skin condition seen mainly in teens. Acne is a growing concern among adults and has even been highlighted by celebrities including Katy Perry, Cameron Diaz and Emma Stone who have all spoken publicly about their struggles with the condition. Low-grade, persistent acne is common among women in their twenties, thirties and forties. While acne may be nonexistent or dormant for years, certain factors like stress, hormones and diet can eventually cause it to surface, with frustrating emotional side effects. Whether brought on by lifestyle (stress, diet), PMS, pregnancy or polycystic ovary syndrome (PCOS), the result is the same - an increase in cortisol (also known as the stress hormone), which gets broken down into testosterone, a male hormone that pumps excess oil through pores. When hormones are not in balance, the skin’s oil production may go into overdrive, causing acne flare-ups. Even a moderate amount of daily stress is enough to trigger a breakout. In addition to seeking treatment to control hormone fluctuations or making lifestyle changes, dermatologists recommend using treatments which contain tried & tested ingredients such as Salicylic Acid and Tea Tree. 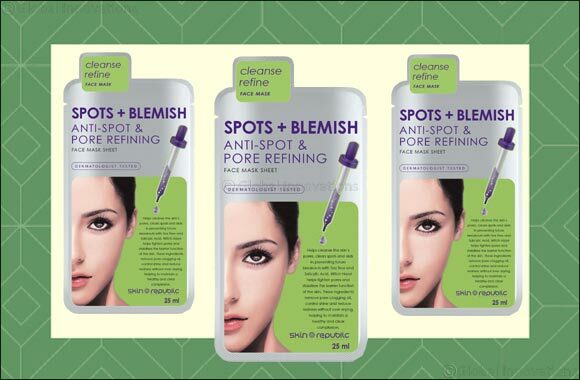 Skin Republic’s Spots + Blemish Anti-Spot & Pore Refining face mask (AED 24) contains proven spot-fighting ingredients that help whether you are struggling with chronic acne or a minor breakout. This sheet mask is drenched in a spot-fighting serum for a clean and clear complexion. Tea Tree and Salicylic Acid help cleanse the skin’s pores and clear spots while Witch Hazel assists in tightening pores. These ingredients remove pore clogging oil, reduce shine and redness without over drying, helping to maintain a healthy and clear complexion.